McAllen Memorial's Suzannah Swanson nears the finish line in the girls 100-meter wheelchair at the Class 6A Region IV Track and Field Meet Saturday April 28, 2018, at Alamo Stadium in San Antonio. Swanson placed first with a time of 24.63 seconds, a new regional meet record. McALLEN — At the regional track meet two weeks ago, McAllen Memorial freshman Suzannah Swanson was shaking hands and making friends with her fellow wheelchair athletes. The group of four others included Weslaco High’s Joe Solis, who Swanson knew from local races. Her outgoing personality and willingness to strike up a conversation with strangers came as a surprise, especially when they heard she was only in ninth grade. The regional meet was special for Swanson because she had the chance to compete against opponents instead of simply racing against the clock. 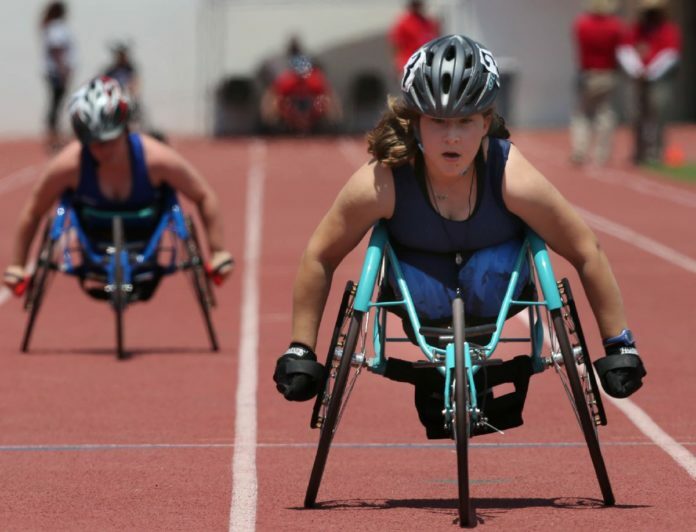 In the Valley, she is the only female wheelchair athlete participating in track and field. Swanson has been overcoming spina bifida — a birth condition that prevents proper spinal cord and spine development — to compete in athletics since she was 8 years old. She learned to swim at 4. She showed up in a big way at regionals in San Antonio, posting times of 24.63 seconds in the 100-meter dash and 1:35.04 in the 400. Both were gold-medal times, and both set meet records. She joined track in seventh grade at Cathey Middle School, and that’s when she learned her legs could become sore. Usually, she has minimal feeling in her lower body. Nothing came easily as she improved. McAllen Memorial girls track coach John Stanley has taken on the task of coaching her. In December, he received some pointers from Paralympic royalty Saúl Mendoza, a former Paralympic and Olympic champion for Mexico. Her father, Casey Swanson, who still cycles and competes in triathlons, was impressed by her hasty improvements. Casey Swanson said Suzannah’s ability to enjoy herself despite being alone for most of her races stands out. “She’s all by herself a lot of time. It takes a lot to do that,” Casey Swanson said. Stanley tried to remedy that as best he could. Whenever possible, he asked meet organizers to let Suzannah race against junior varsity competitors in open events like the 400 or 100. She’ll have two more races this year to try to best her peers, and they will be her fullest high school races yet. Three other girls will fill the lanes in the 400 race, and six others will compete in the 100 today at Mike A. Myers Stadium in Austin. In the sprint, she’ll be seeded third and run sandwiched between the first- and second-seeded racers, who were just more than a second quicker in their regional races. While Suzannah, her father and her coaches are all hoping for gold, Casey knows that every race is an accomplishment, no matter the result.